We woke up on our second day in Italy to this incredible view a few steps from our door. We were in in Positano mid-April and only saw 2-3 couples our entire time staying at Casa Teresa, so we basically felt like we had the place to ourselves! The tourist season had just started and most of the bars and restaurants (even the most famous ones like Le Sirenuse) had more than enough availability every night, so it was overall a great time to visit. The madame of the house would put out different meats, cheeses, and breads every morning. The best part of breakfast were the freshly baked croissants with lemon curd and made to order cappuccinos (the madame didn't speak much English other than to offer "Cappuccino?" to us every morning). After breakfast, we walked down the flights of stairs down to Spaggia Fornillo which was also deserted. The landscape reminded me something out of Game of Thrones! We took the same path of the Americans over to the main beach area to buy our ferry tickets to Capri, the famous island a couple miles away. How unreal is this view?? We saw this every day when walking from our hotel through the Path of the Americans down to the main beach (Spaggia Grande). On the main port in Positano, there are various ferry companies that will shuttle you to and fro to different locations on the Amalfi coast. You can take them to Capri, Sorrento, Amalfi, etc. Try to get seats or stand in back of the boat when you're leaving Positano, and sit in the front on the way back. A day trip to Capri won't be cheap as the round trip tickets were about 45 euro, then you need to factor in boat trips when you actually get to the island itself. You do NOT need to purchase tickets beforehand as they are basically never sold out and the lines were never that long. After a windy ride about an hour later, we arrived in Capri, which has somewhat of a controversial reputation. Many people don't think it's worth going to Capri as it's basically an island full of expensive boutiques (one of its attractions is a street nicknamed Rodeo Drive), but you really get a sense of the extravagant history of the island (basically an expensive playground for the rich and famous for the past 50 years) and we thought it was still worth going to. After docking in Capri, we deboarded the large ferry and got tickets for a smaller boat to take a loop around the island through Laser Capri. Once again, we did not book beforehand and just bought tickets the day of, which allowed for maximum flexibility. Tickets were about 20 euro for about a 2 hour trip (one hour of which was spent at the Blue Grotto). 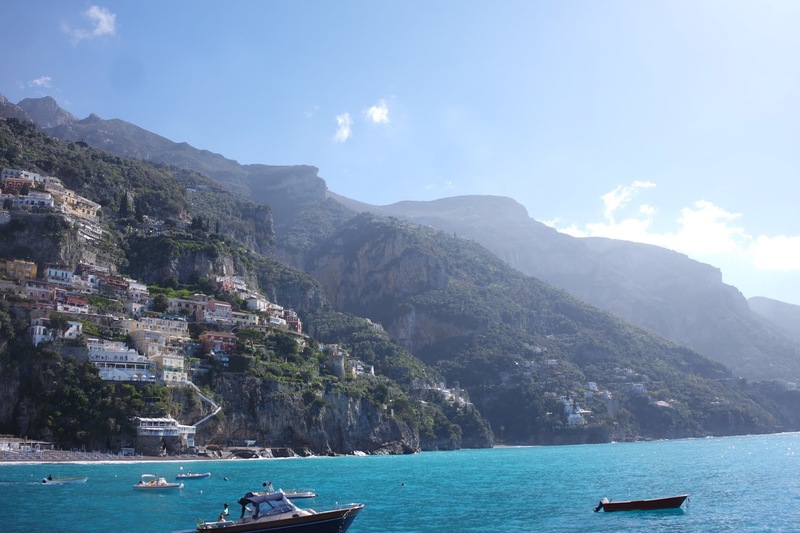 We made a loop around the island while the narrator told us some of the history of the island, but the main attraction was a stop at the Blue Grotto. The grotto has gained a famous reputation for basically being famous, but the experience was fun nonetheless. You stop at the Blue Grotto and then wait in line as your entire boat debarks and climbs into smaller boats to enter the Grotto. There's also a 14 euro entrance fee which is again, pretty expensive for a 10 minute experience. But the process of getting in and out of the grotto is a hoot! Your boatman jokes around, sings, and makes you feel comfortable as he makes you lean back and squeeze into a tiny opening to the grotto. After the boatman squeezes you into the tiny opening of the blue grotto (you may or may not get wet in the process), you float around the cave which glows blue depending on how the light hits the water. And then you wait as the rest of the passengers on your boat do the same thing. We probably ended up waiting for about a total of an hour (and if you don't wait for your boat, you have to wait in line as there are other boats and other passengers who get there via bus who are in line too). After the boat tour, we finally got back on land and took the bus up to the main town of Capri. The public bus itself is a fun ride as it takes you up the mountain to the Capri through the lemon groves and windy streets. Once you get to Capri, there's not much to do there per se other than to sit out on the square, visit the expensive boutiques, and walk around. We walked across town to the public garden (only 1 euro to enter) which has some of the best views in Capri. While the cliffs are the main attractions, the garden was an underrated feature of the park. One of the fancy hotels on Rodeo drive. We then went back down the mountain back to Marina Grande, the main port and a town in itself. If we had more time we would have take the bus up to Anacapri, a higher town where you can ride a chairlift up to the highest point of Capri, but we felt like we already had a good view already, and didn't want to miss our connection back to Positano. Then raced onto the ferry back to get seats in the front so we could get these pictures on the bow. Once we got back to Positano, we scrambled back to Spaggia Fornillo and up the stairs to our hotel to change for dinner. I had my eye on Cafe Positano for dinner located a few minutes from us. It was located right on the edge of the road and had the prettiest view over Positano. However, even though their views were to die for, the food was very overpriced. I got white fish (which was good) and wine, but it ended up being close to 30 euros. We walked over to the restaurant just up the street from Cafe Positano and just a few stairs away from our hotel (we called it the "red place," Saracen d'Oro) for dinner #2. Even though the pics were not that impressive, we loved Saraceno d'Oro for its family owned atmosphere (the waiters were super friendly), Italian music, and humble prices. We splurged and got a pizza, a half carafe of wine, and lemon sorbet to share, which totaled only 26 euros! Plus we got 10% off for staying at Casa Teresa. Such a change compared to the meal we had just an hour earlier. The pizza at all the restaurants we had was so good we had pizza for every meal! And it was half the price of pizza in SF. Stuffed from our two dinners, we walked down a few flights of stairs back down to our hotel room and called it a night. Next up: Ravello!